Wow. 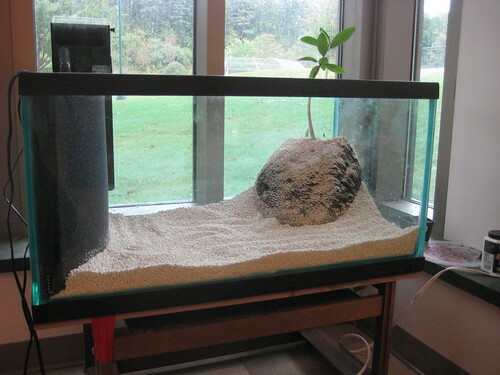 The brackish mangrove tank has been up and running for 3 years! In that time I’ve figured a few things out. Mangrove seedlings really do not like to be planted in deep ( > 4″) water. If you are going to keep the tank temperature close to 80F/26C in a climate controlled building a chiller is not necessary, even if the tank is in a window. The only time the chiller ran was when I fiddled with the controller to test it. In spite of all its good points (weight, etc.) I am still not a fan of acrylic for tank construction. 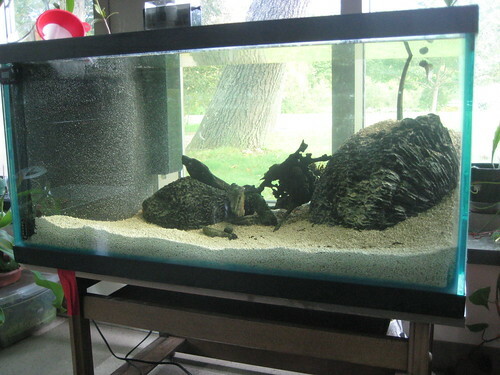 Over the summer I took it into my head to re-do the mangrove tank. I wanted to move it and swap out the (starting to scare me w/ cracks) acrylic tank for a glass one a friend had given me (thanks, Scott). 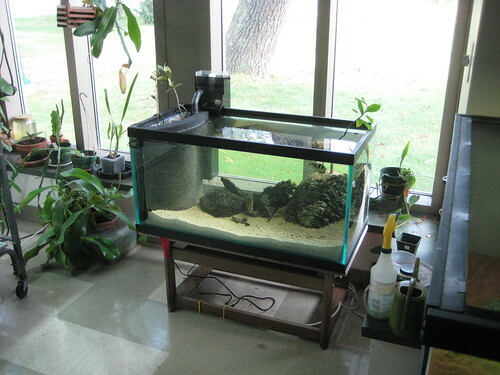 The original tank was 48x18x18, with an 18″ cube at one end housing the filter (6″) and chiller (12″). The new one is 36x18x18 – exactly the same water volume – and as we did the move we’d be able to rotate it 90 degrees so the 36×18 side would face into the room. Getting things ready. 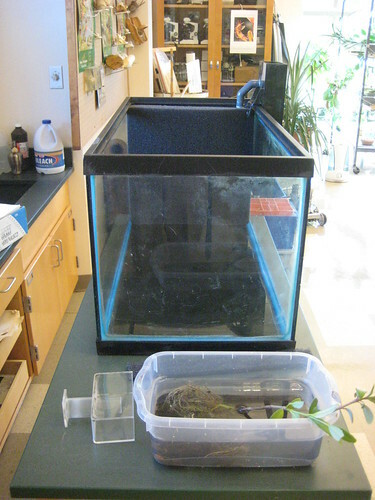 Two black mangroves, the tank, filter foam and a foam fractionator (aka protein skimmer). 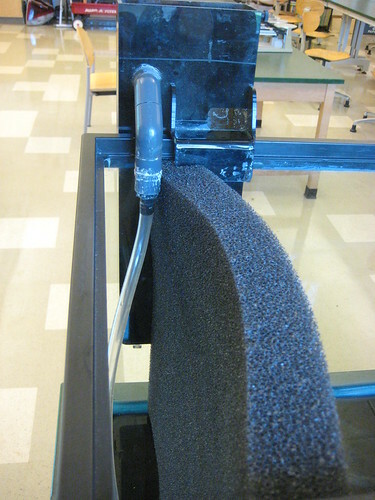 Test fitting the filter foam. I set up a modified Mattenfilter using Poret foam. I can’t recommend this rig highly enough. 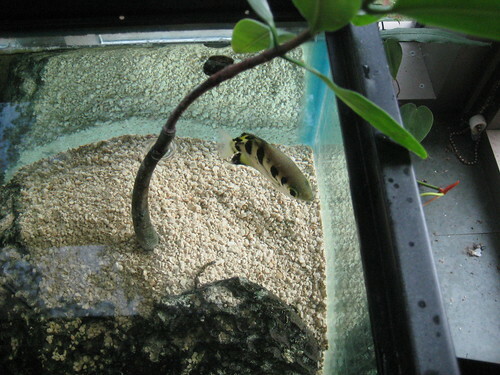 I have 2 freshwater aquaria set up this way (powerhead just recircs back into the tank – no skimmer) and -knock wood- they both work beautifully. The roots of 2 black mangroves and the planters both will go into. 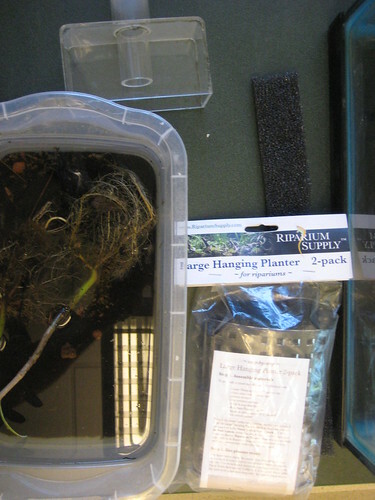 Mangroves and planters courtesy of Riparium Supply – thanks, Hydrophyte! Old tank drained and moved, new tank in place. 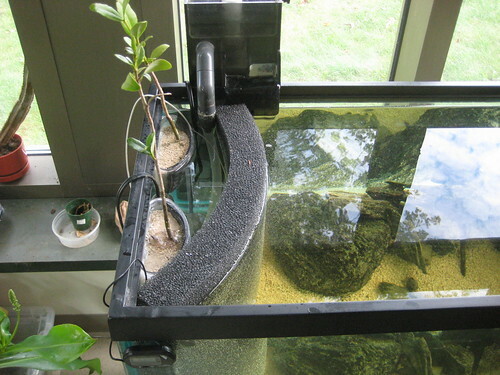 The mechanicals – pump, heater, skimmer – are ready, the red mangrove is planted in some muck scooped from the old tank and the substrate is in place. I saved about 25 gallons of water from the old tank – in it goes, along with enough new water to get us where we want to be. I’ll update as things settle in, meanwhile, there are more pictures here. This entry was posted in creatures, Worldbuilding by dr.hypercube. Bookmark the permalink. My pleasure my friend. Glad you could use it.